St Kitts Vacation Rentals, condos for rent at Island Paradise Beach Village, Frigate Bay, St Kitts. 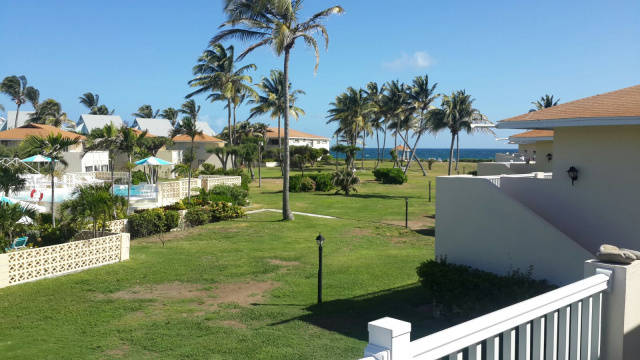 Oceanview 2 bedroom 2 bath fully furnished upper floor unit for rent at Island Paradise Beach Village directly across the street from the Royal St Kitts Golf Course and 2 properties away from the Marriott resort. Island Paradise is located on the Atlantic Beach (not recommended for sea bathing) and just a short walk away from the popular Frigate Bay beach. Amenities include swimming pool, barbecue area, lush tropical garden and direct access to the beach. This tastefully furnished unit is equipped with cable tv, microwave, coffee maker, linen, towels, etc. ENJOY FREE WIFI FROM THIS UNIT. 2% GOV'T TAX PAYABLE ON THE ABOVE RATES. 25% deposit required to reserve the condo with balance due on or before arrival. 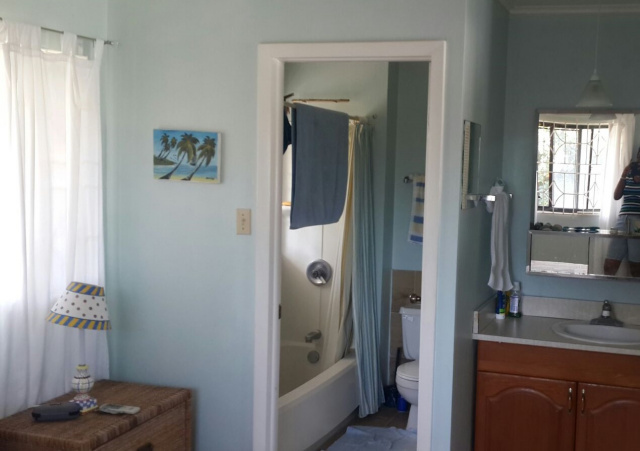 Both bedrooms are equipped with ensuite bath. Owners and guests share common laundry on the compound. You will enjoy an oceanview from the spacious patio measuring almost 300 sq ft.
Open plan living/dining area equipped with 2 ceiling fans, screened windows and screened glass doors to keep you sufficiently cool.